What is climate change mitigation? The UN's climate panel has published the third part of its long-awaited report - on strategies for mitigation. The document by the Intergovernmental Panel on Climate Change (IPCC) considers the options for limiting or preventing greenhouse gas emissions and enhancing activities that remove them from the atmosphere. The term mitigation refers to efforts to cut or prevent the emission of greenhouse gases - limiting the magnitude of future warming. It may also encompass attempts to remove greenhouse gases from the atmosphere. It differs from climate change adaptation, which refers to the actions taken to manage the unavoidable impacts of climate change. Adaptation is dealt with in the IPCC's working group 2 report. Mitigation may require us to use new technologies, clean energy sources, change people's behaviour, or make older technology more energy efficient. Which energy technologies can help? Switching to low-carbon energy sources such as wind power, solar, geothermal, hydroelectric or nuclear represents one of the major strategies for lowering the emissions of greenhouse gases in the atmosphere. The take-up of renewable energy - from sources that do not deplete over time - is growing. Figures from the UN show that renewable energy raised its share of total energy generation last year from 7.8% to 8.5%. But they also reveal that investment fell by 14%. These technologies still face barriers related to capital costs (the upfront costs of building the plant and maintaining it), financing, public perception and a longstanding dependence of markets and institutions on fossil fuels. But the IPCC's third report says many renewable energy technologies have made progress in both performance and cost and that their role in reducing air pollution and providing energy security outweighs possible disadvantages. The scale of the challenge is daunting - fossil fuels make up about 80% of all energy. But technologies such as carbon capture and storage (CCS) could help reduce their impact. One form of CCS involves chemically capturing the carbon dioxide from a power station flue, and then piping it underground so that the invisible gas is contained in rock formations without leaking. Existing oil fields, un-mineable coal seams and underground salty aquifers are all among the geological sites that are considered suitable for CO2 storage. But while CCS could, in theory, limit the amount of carbon going into the atmosphere, it doesn't do much for the CO2 already there. How else can we help curb climate change? Greening urban areas can also make a difference. Cities are home to half the planet's population, and are responsible for three-quarters of energy consumption and 80% of carbon emissions. Retro-fitting buildings to make them more energy efficient and cutting the impact of transport emissions represent some of the strategies for doing this. Tackling waste is also an issue. About 11.2 billion metric tonnes of solid waste is currently being collected around the world every year, and the organic portion that decays is contributing around 5% to global greenhouse gas emissions. Experts would like to reduce its impact primarily by producing less but also recycling more and treating waste in a way that is less harmful to the environment or even using it as a sustainable energy fuel source. Mitigation also extends to the protection of natural carbon "sinks" like the forests or oceans. New sinks can be created through, for example, forest regeneration. Geo-engineering is one controversial area that has gathered momentum in recent years. It requires the deliberate intervention in the climate system with the aim of curbing global warming. One example is Solar Radiation Management (SRM), which involves reflecting more of the Sun's rays away from the planet back into space. This could be done by pumping sulphur aerosols into the high reaches of the atmosphere, where they would have similar reflective properties to the ash released naturally by volcanoes. 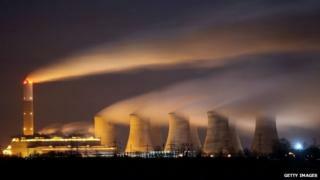 The IPCC's third report also considers a little-known technique called Bio-Energy Carbon Capture and Storage (Beccs). As the name suggests, this would combine the burning of biomass, such as wood, for energy and then piping the CO2 into rocks. In theory, you could begin to remove emissions that have already been accumulated in the atmosphere. But critics of this approach warn that the technology is unproven and could give reluctant countries an excuse not to cut emissions.